USDA is committed to helping organic agriculture grow and thrive. To help meet Secretary Vilsack’s goal of increasing the number of certified organic operations, USDA is delivering results through its many programs which serve the growing organic sector. October 2012 marked the 10th anniversary of the USDA Organic Seal, and we are proud that it has become a leading global standard. Over 25,000 farmers, ranchers and other businesses get many benefits from USDA organic certification. Many receive premium prices for their products through the growing $35 billion U.S. organic retail market. 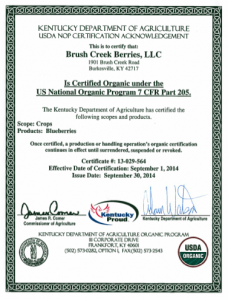 Most operations that grow, handle, or process organic products-and want to call their products organic-must be certified. USDA has strengthened its oversight of organic products, using methods such as inspections and residue testing to ensure the integrity of organic products from farm to market. We’ve created a level playing field by developing clear standards, investigating consumer complaints, and taking action against farmers and businesses that violate the law. In addition to setting the standards for U.S. organic products, USDA supports organic agriculture in all of its agencies. In May 2013, Secretary Vilsack issued new Guidance on Organic Agriculture, Marketing and Industry (PDF, 96KB) directing all USDA agencies to support organic agriculture and markets. USDA offers a wide variety of funding opportunities, including conservation grants, organic crop insurance, and simplified microloans. To learn more about USDA programs and how they support organic agriculture, view the USDA’s Organic Resource Guide (PDF, 1.8MB). Trade partnerships streamline organic exports and imports with other countries, increasing the market share of organic products worldwide while maintaining rigorous production standards. Additionally, foreign products certified to the USDA organic standards can access the U.S. market. USDA also provides current prices for organic apples and other market information, funds research at public and private institutions, and provides practical advice to farmers and ranchers. Overall, USDA oversees organic farmers and businesses to make sure that organic food is produced with organic methods. Each year, organic farmers update a farm plan and complete an inspection to confirm that their practices match their records. The farmer must correct any issues to continue certification. Organic food processors meet similar requirements. If you are concerned that an organic product isn’t meeting the USDA standards, you can submit a complaint to the USDA. We investigate every complaint we receive, and if we find any problems we take action. Anyone can file a complaint by contacting the USDA.